Sarkis is a wildly popular Armenian restaurant in Palermo, and for very good reason. It’s cheap, the servings are abundant and, most importantly, the food is wonderful. 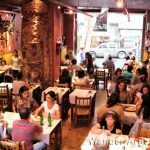 Thanks to a large Armenian community in Buenos Aires, there are a number of restaurants around Palermo Soho area that serve that country’s delectable Greek/Middle-Eastern style food, and judging by the lines outside of Sarkis every night, it is commonly considered one of the better ones. We recommend bucking the Buenos Aires trend and getting in nice and early. Doors open at 8pm, and if you arrive any later than 8:30, expect to wait at least half an hour for a table. At peak time – around 10pm – the wait can be over an hour. If you are a fan of Greek, Turkish and Arabic food, you will find Armenian cuisine to your liking. Dishes are mostly around the US$7 mark, and the idea is to order a variety of plates for everyone at the table to share. For those who have no idea, asking the outwardly grumpy but duly obliging waiters at Sarkis is a good place to start. They will be able to suggest a good ‘Armenian for dummies’ combo to introduce you to the wide variety of flavors on the menu. A good introductory combination is Hommus (pure de garbanzas), Marinated Eggplant (berenjenas), Stuffed Pear Leaves (hojas de pera rellenas), Fellafel and Kefte (spiced meat rolls), but there are plenty of other ways you can mix and match to your tastes. There is a decent selection of wines on the menu, as well as real Armenian coffee that has the consistency of mud and has enough caffeine to keep you awake all night should you choose to sample the Palermo bar and club scene later on. The place itself is huge. It’s also noisy and not particularly pretty inside, but once you try the food, you won’t be bothered too much about the atmosphere.